Freetown is the capital, principal port, commercial center, and largest city of Sierra Leone. The city was founded by British Naval Lieutenant John Clarkson and freed American slaves from Nova Scotia. Freetown was part of the larger colony of the Sierra Leone which was founded by the Sierra Leone Company (SLC) in 1787. The SLC, organized by British businessman and abolitionist William Wilberforce, sought to rehabilitate the black poor of London and former slaves of North America by bringing them to the settlement in Sierra Leone where they would stop the African slave trade by spreading Christianity through the continent. The first groups of blacks, about 400 Londoners, arrived in Sierra Leone in 1787 and established Granville Town, named after British abolitionist Granville Sharp. When the settlement was destroyed by the indigenous inhabitants in 1789, British abolitionists sent a second, larger party of 1,100 former American slaves who had been resettled in Nova Scotia at the end of the American Revolution. These settlers established Freetown in 1792. In 1800, 500 Jamaican Maroons were landed by the British. The surviving Londoners, the Nova Scotians, and Jamaican maroons, intermarried to create the Creole population of Freetown. The Creoles banded together partly because of their Christian background and western culture but also because they lacked the tradition of native law and custom which dominated the lives of the indigenous people. Creoles also had important connections with British colonial officials who administered Sierra Leone from 1808 when they assumed control over the SLC colony, to 1961 when Sierra Leone gained its independence. Those connections allowed the Creoles, always a tiny minority of the colony’s populace, to become the most powerful and influential group, after the colonial administrators, in the city and colony. From 1808 to 1874 Freetown was the headquarters for the Royal British Navy’s West African Squadron which captured slave ships headed for the Americas and released their cargo in the city. Thus, Freetown had a population from all across West Africa. Eventually these people became the largest segment of the Creole population. In 1961 Sierra Leone gained its independence and Freetown with a population of approximately 100,000 became its capital city. After independence, Freetown like most capitals of newly created African nations, received thousands of migrants in search of employment. These migrants became involved in the city’s politics, challenging the Creoles for dominance. Most of the migrants were Muslim and stood in sharp contrast to the Christian Creoles who nonetheless continued to control the civil service, most professions and the business community. Sierra Leone’s ability to avoid political unrest ended in 1990 when a civil war broke out. The war destroyed much of the city’s infrastructure and economy. Continuing ethnic violence in the countryside however, forced a mass immigration of people into Freetown. Twelve years of nearly continuous civil war finally ended in Freetown and Sierra Leone in 2002. As a chief port city of Sierra Leone, Freetown is the commercial center for trade in platinum, gold, diamonds, and oil. It is also known as the home of Fourah Bay College, established in 1827 as the first Western-influenced college in West Africa. Through the 19th Century, Fourah Bay College attracted students from across West Africa who wanted to be educated. 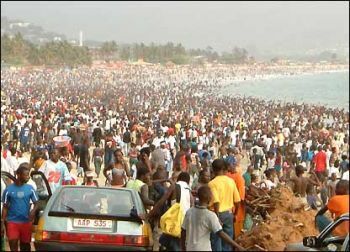 In 2004 Freetown had a population of 1,070,200. In 2014 Freetown faced a new challenge as its citizens had to cope with the ebola epidemic. Michael Banton, A West African City: A Study of Tribal Life in Freetown (London: Oxford University Press, 1969); Christopher Fyfe, Freetown: A Symposium (Freetown: University of Sierra Leone, 1968); Fourah Bay College: University of Sierra Leone. http://fbcusl.net/. College: University of Sierra Leone. http://fbcusl.net/.